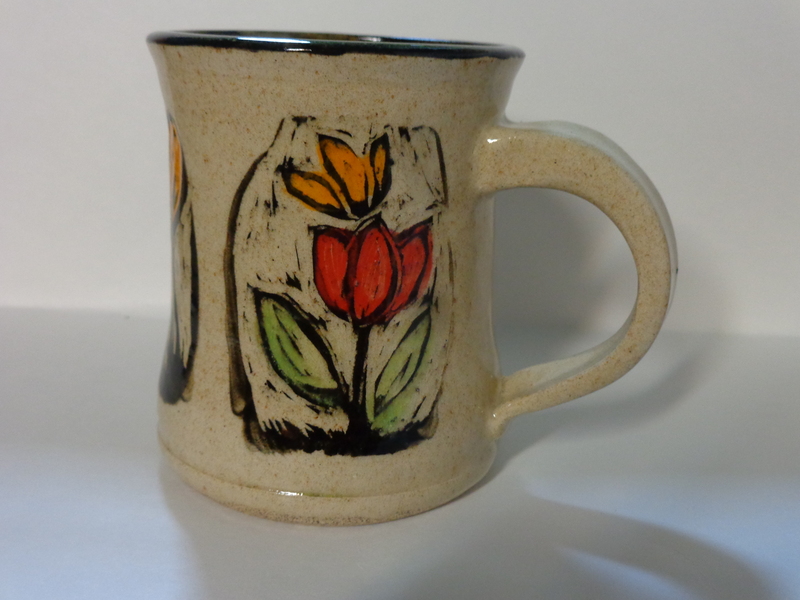 Looking forward to Sunday’s Fat Robin Pottery Open House for a number of reasons! I’ve been experimenting (as usual) with spring themed designs and colors on mugs, vases, bowls, planters, magnets, tiles, and garden markers..
I’m looking forward to customer feedback on designs, shapes, and ideas. This is when I get great ideas for going forward! The boxes of test pieces and trial and errors is overflowing—this is a great chance for me to make room for future tests! The hubbard squash have finally been laid to rest but you can see the great glaze combinations I have used on plates and bowls using the hubbards as my mold. 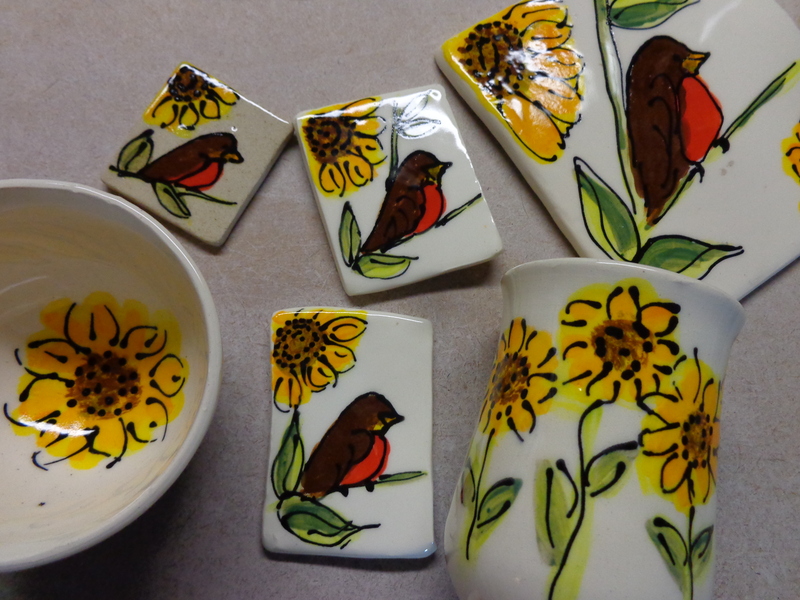 Still have a dwindling supply of 2013 mugs, bowls, and serving pieces to complement Fat Robin Pottery that you already have! It’s going to be sunny! Almost May greetings! The Fat Robin has emerged from winter hibernation (not really—we all know that robins stay around in the winter—they are just not a bird feeder bird so we don’t see them!) 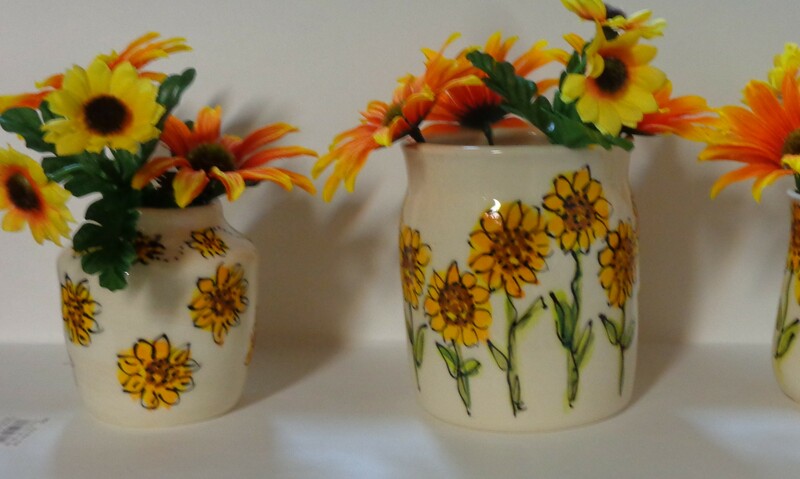 and has been busy at work creating new spring pottery. Just in time for Mother’s Day ….. The hubbard squash have slowly decomposed in my basement but not before I was able to expand my color palette and glaze them in many new colors—including a spring green and blue which I am working on now. 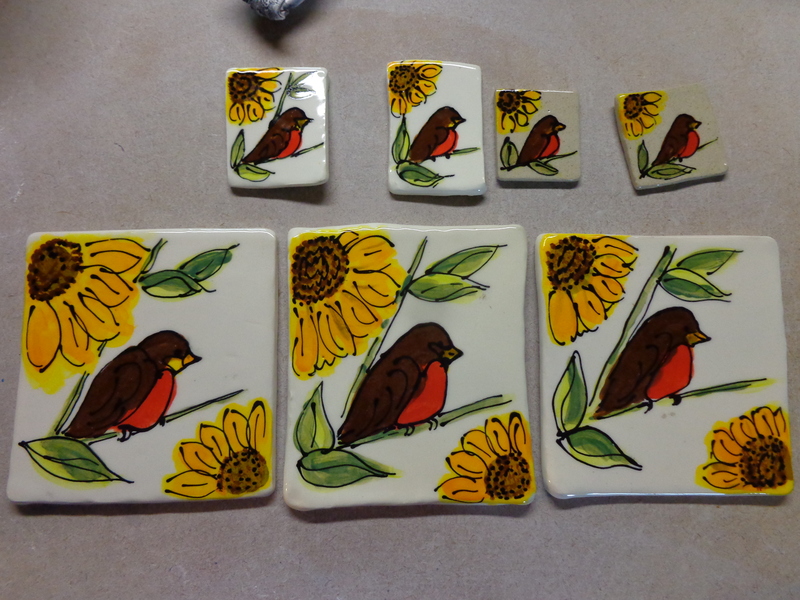 New spring designs on mugs, bowls, and vases….also fun and functional plant markers for indoor and outdoor plants…and the creation of tiles, coasters, and magnets with a Fat Robin on them! The Robin’s Nest (i.e. my garage) will be open from 11:00 a.m. to 4:00 p.m. Stop by before, during, or after the Police Parade on Broadway. Call if you can’t make it and we can set up another time for you to stop by…. Fat Robin Pottery is available any day of the week at the Armory Antiques Marketplace in downtown Newport. The Fat Robin showcase is N-9, which is on the left wall toward the back of the store. The Armory takes cash, checks, and credit cards. It’s spring—the daylight is longer and brighter, the air (and my cellar) is warming, the crocus and daffodil are blooming, and Fat Robin Pottery has emerged from its winter hibernation! What’s new for 2014? 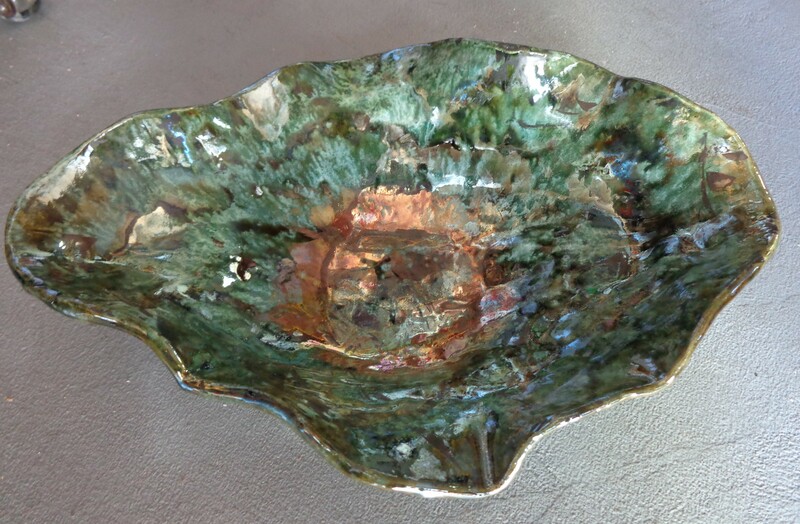 Sadly, the very useful hubbard squash in my cellar are slowly rotting, but not before they are being used to the utmost to make hubbard bowls with raku clay and then fired in my friend, Charlene’s, raku kiln. 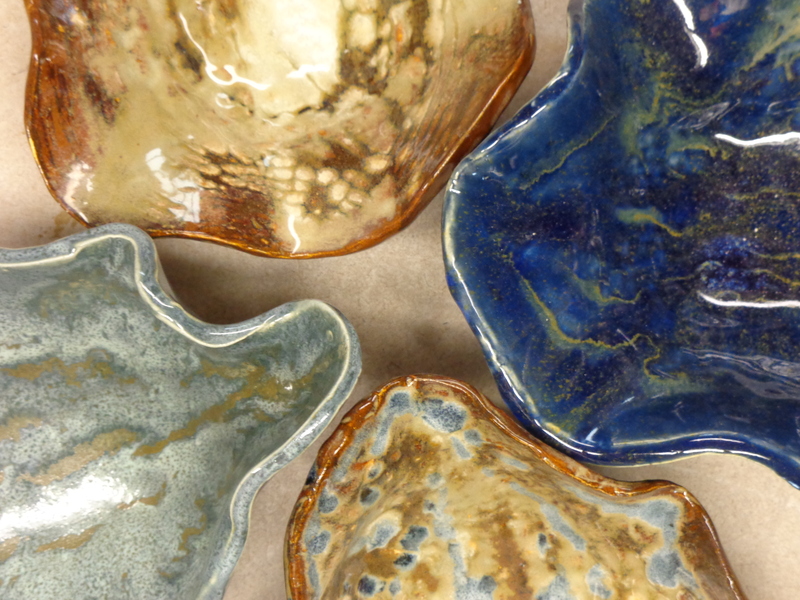 A fellow potter, Elena Obelenus, is preparing for her upcoming show at the Providence Art Club in May, and I helped her fire many stunning pieces for the show. Her work is detailed, meticulous, and breathtaking. 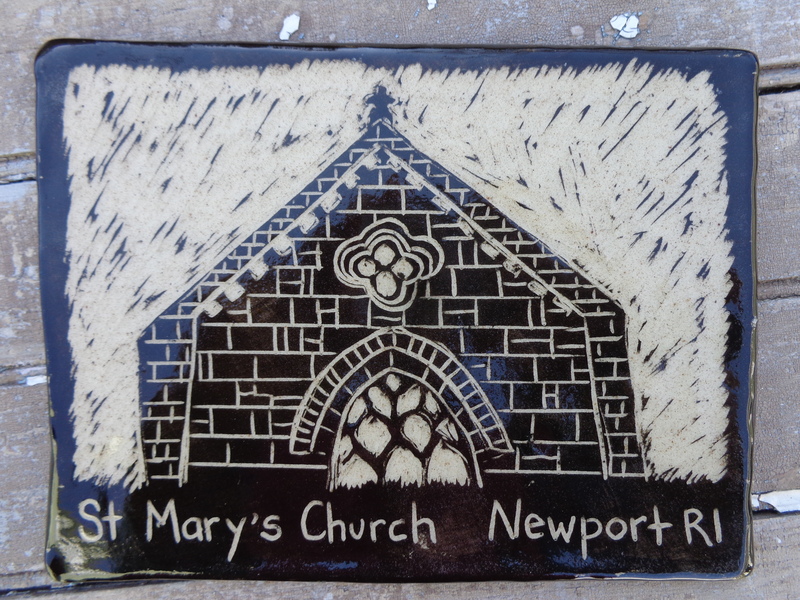 Trying to make the most of my booth space at Armory Antiques Marketplace in Newport, I am creating and experimenting with sgrafitto and making tiles and Christmas ornaments with familiar Newport scenes. When you travel and visit a new place, what do you like to buy as a reminder of that place? I look for local art , local food, or local wine, and a holiday ornament with a familiar scene from that place. And there’s always a refrigerator magnet…. Any other ideas? I’m also working on other glaze combinations for the few remaining hubbard bowls in stock, and the results are excellent! Imagine hubbards in dark blues and mottled browns. And then there’s always a pit fire at my sister’s house in Maine…already planning and creating new items to smoke! The 2014 creativity has begun—lots more ideas will bloom!